Dr. Hauschka Clarifying Toner 100ml is a clarifying facial toner specially formulated for oily or blemished skin, designed to balance excessive oiliness, soothe redness and irritation, and minimise the appearance of blemishes, blackheads and enlarged pores. Extracts of Daisy minimise the appearance of blackheads and blemishes, Anthyllis balances skin for a calm, even appearance, and Calendula to reduce excessive oil production and soothe irritation, all for a more radiant, rosy complexion. Skin Type: Oily Skin, Blemished Skin, Combination Skin. Award: Beauty Shortlist Awards 2017, Winner; NEW: BEST SKINCARE PRODUCT FOR ACNE Dr Hauschka Clarifying Toner. 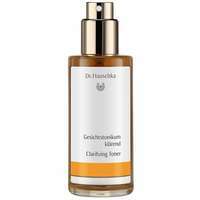 Dr. Hauschka Clarifying Toner 100ml was found on 4 websites and was price compared using EAN: 4020829005259. The cheapest Dr. Hauschka Clarifying Toner 100ml is shown as the main item, prices range from £19.95 to £24.50, excluding delivery. Price comparison based on price and delivery charges, with any valid discount codes being applied, is shown in the table above. Prices and information correct at the time of publication.